eD@HoMe: An Expo 2010 cover from Hong Kong! Expo 2010 Shanghai China (中国2010年上海世界博览会) is being held on both banks of the Huangpu River in the city of Shanghai, China, from May 1 to October 31, 2010. It is a World Expo in the tradition of international fairs and expositions. The theme of the exposition is "Better City – Better Life" and signifies Shanghai's new status in the 21st century as the "next great world city". 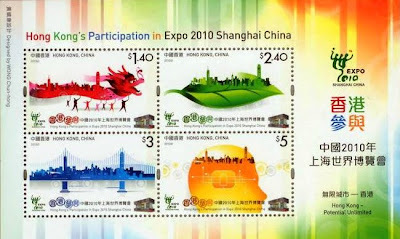 The expo Logo features the Chinese character 世 ('world') modified to represent three people together with the 2010 date. It is the most expensive Expo in the history of the world's fairs. The Shanghai World Expo is also the largest World's Fair site ever at 5.28 square km. 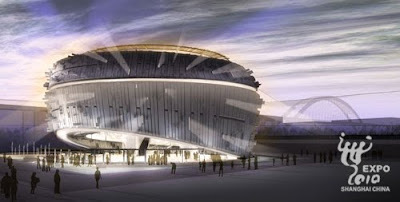 189 of the world's 196 nations will be represented at Expo 2010, either in stand-alone pavilions or within larger pavilions. Singapore, my country also has its own pavilion; a two-story music-box-like structure with an "Urban Symphony" theme. The theme is inspired by the harmony of unique elements in Singapore: progress and sustainability, urbanization and greenery, tradition and modernity and a cosmopolitan mix of residents of different races living peacefully together. 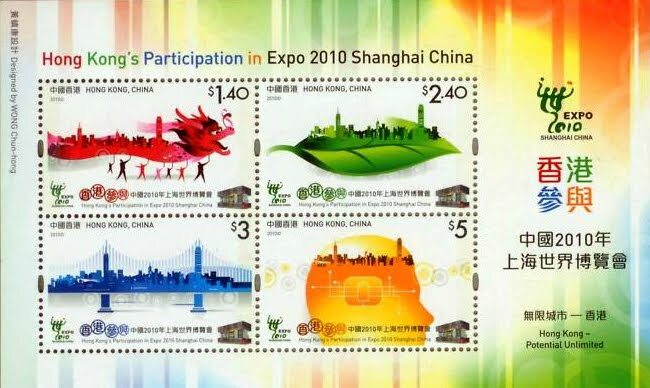 To commemorate Hong Kong's Participation in Expo 2010 Shanghai China, Hong Kong Post issued a set of 4 beautiful stamps on 27th April 2010. 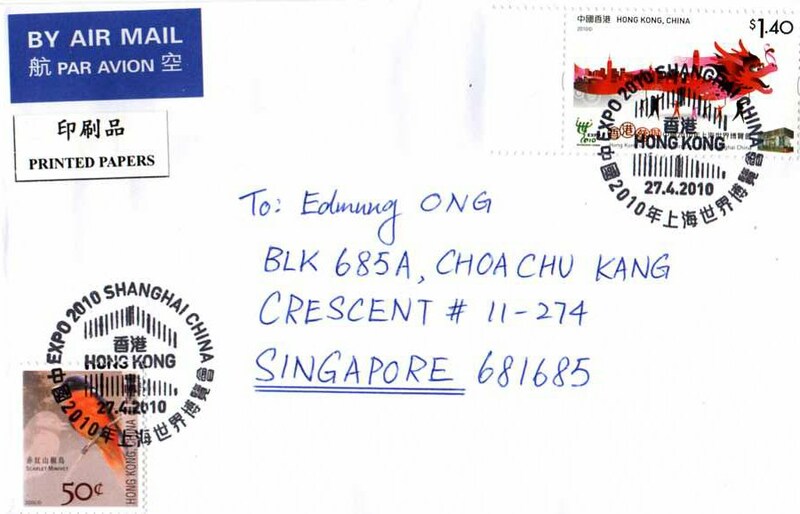 Many thanks to Brian Kam for sending me this lovely cover franked with an Expo 2010 stamp (top right) and Expo 2010 postmarks. The bottom left stamp belongs to the 2006 Birds Definitive series.